The Tea Building has been somewhat of a Shoreditch icon since the 1930s. Located on the corner of Shoreditch High Street and Bethnal Green Road, the far from pretty building was initially designed as a bacon curing factory which Lipton Tea later used as a storing warehouse. Since gentrification hit Shoreditch in full force, the building has opened its doors to dozens of trendy designers and eateries including Pizza East and members club Shoreditch House, giving them a chance to put their own stamp on the building. Lyle’s is the latest resident of the Tea Building, opening in April last year. Since opening, Lyles has made quite the stir in the foodie community, so much so that it has just been awarded its first Michelin star. On a recent trip to London last week, I visited Lyle’s to find out what the fuss was all about. On a rain soaked “summer’s” evening, I made a b line to Shoreditch High Street in search of Lyle’s. May I point out that the entrance can be difficult to find, especially if you are expecting to enter via Shoreditch High Street (it’s actually on Bethnal Green Road) next to Pizza East. Not that Pizza East staff actually knew where Lyle’s was themselves. 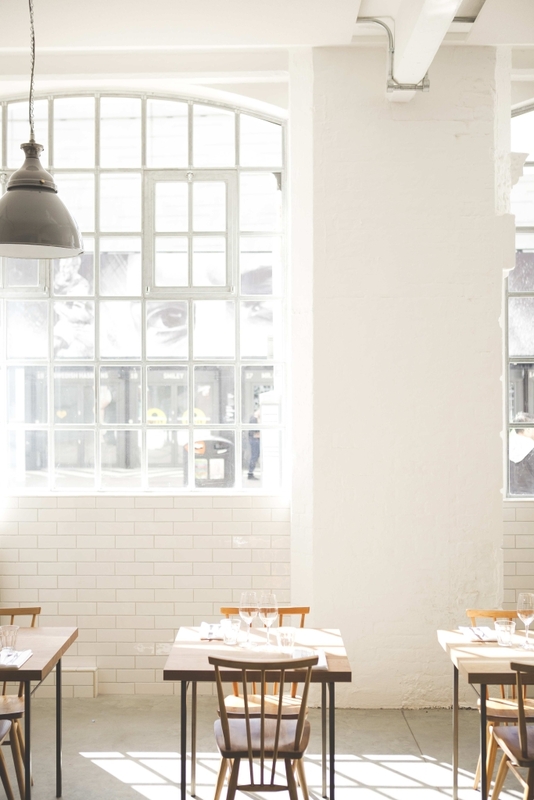 Upon entering Lyle’s you’re welcomed by a casual, stripped back dining room. I would be lying to say that I was immediately impressed. Light streams through the large windows, which gives the place a touch of warmth. But as far as atmospheric dining rooms go, this is not one of them – if anything, the room is a little stark for my liking. Some diners even likening it to a prison. 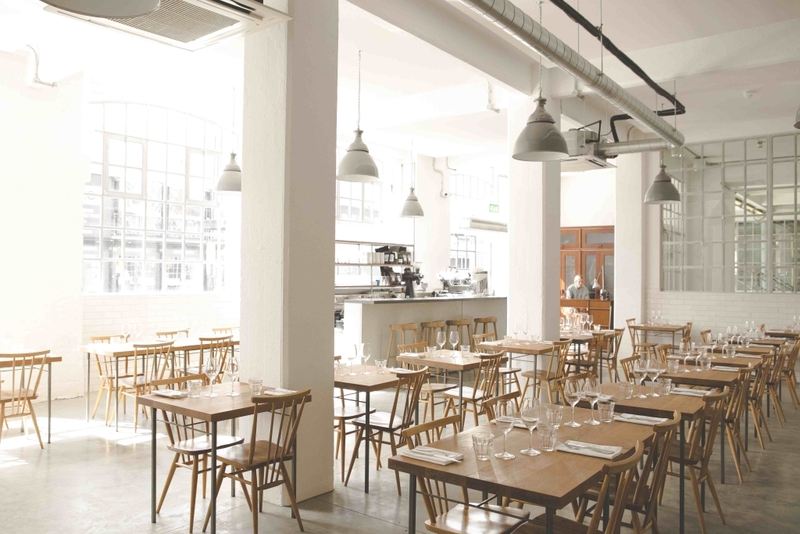 The décor is reminiscent of typical restaurants in the hipster zone – contemporary, semi industrial, minimalist. 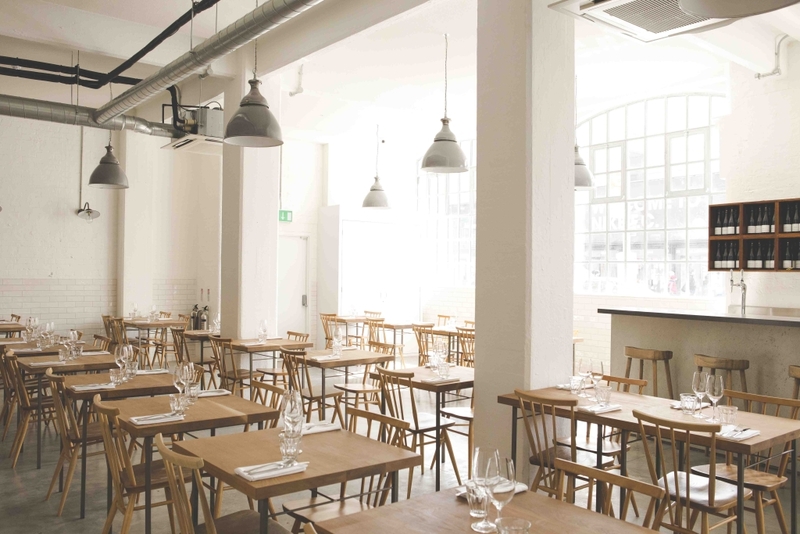 Polished concrete – tick, semi-whitewashed exposed brick – tick! You get the general idea… There’s no frills and fuss about this restaurant– which doesn’t bother me in the slightest, as long as the food is good. The dining room reveals an open kitchen where you have a bird’s eye view of chefs eagerly at work, amongst the stovetops, wood burning oven and charcoal grill. There’s a good energy here – it’s obvious they take the food seriously but aren’t afraid to have a bit of fun at the same time. Head chef, James Lowe (ex St John Bread and Wine and Ten Bells) is at the helm so rest assured you’re in good hands. As for the service there’s no pretension here, yet it is attentive and knowledgeable. In typical Lowe style, the menu focuses on simple clean bold flavours, with a sight creative twist. For dinner, there’s a daily changing set menu and an additional alternative for vegetarians. It’s a good idea to check out the menu beforehand, particularly if you have any special dietary requirements or food aversions. As for me, I often like to leave it up to the experts and to challenge my taste buds to experience things I wouldn’t normally order. The starter is a small plate of pumpkin, whey butter and chestnuts. After seeing it on the menu, I wasn’t particularly excited about it. But without a smidge of decision-making power during the dinner service, I had no choice. Perhaps this is why a tasting menu like this can work – sometimes impressions aren’t what they seem. 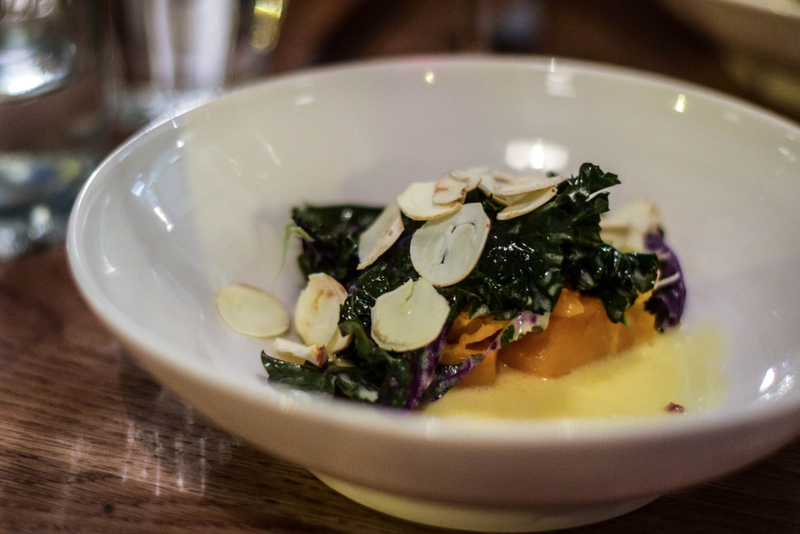 Stacked with a handful of crispy kale, the sweet pumpkin soaked up the whey butter beautifully, giving it a rich full-bodied flavor. Wafer thin slithers of chestnuts were sprinkled on top of the dish, giving the dish a further bang of earthy tones. 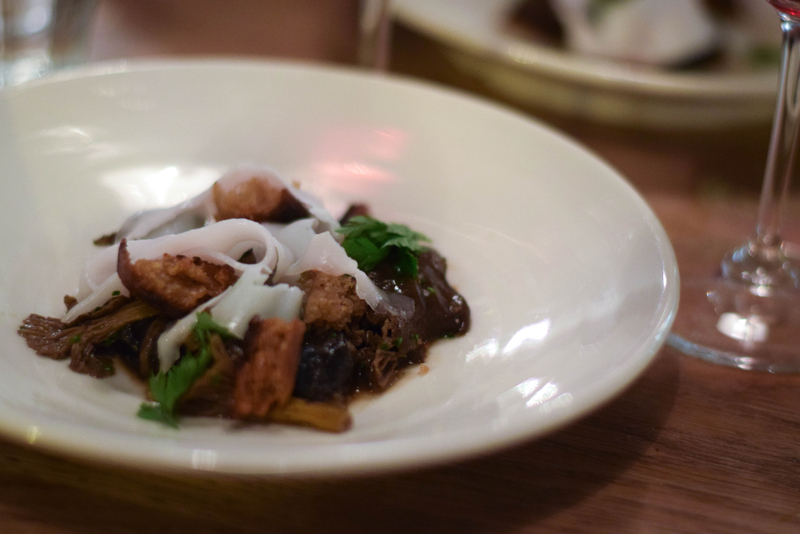 Then came the snails, chanterelles and pork fat, a dish which went down like a lead balloon for the couple on a first date at our neighbouring table. I assume snails were not on her weekly household rotation. Removed from the shells, the snails were well seasoned – slightly buttery with a possible kick of garlic, accompanied by a generous smattering of chanterelles and pork fat. For me this dish was a little rich and needed something a little lighter to cut through the richness. Paired with celeriac, a Welsh Black Rump, cooked medium rare, was a sensation; its meat was succulent and rich, despite its firm texture. 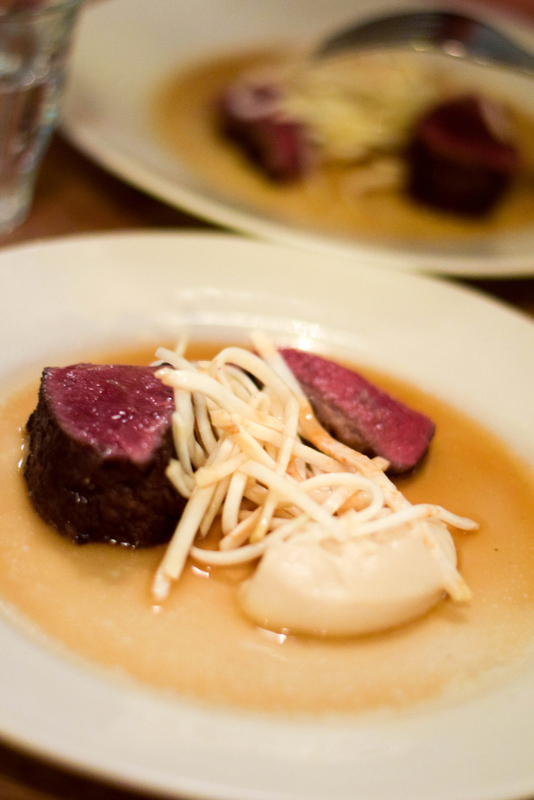 The mild, almost nutty, flavour of the celeriac was the perfect companion. Finally a fig leaf ice cream was served for dessert, topped with figs and a moss green verbena granita. Apologies My photos were too blurry of this one! For a set dinner menu option in central London, I found Lyle’s great value for money. Lowe’s approach to no-fuss honest British food is refreshing. I can’t wait to go back for more.